Ephedrine Effects. Kleinmark, Erika . Lethbridge Undergraduate Research Journal. Volume 1 Number 1. 2006. Presently our society is obsessed with the way we look. It is not good enough to just exercise and eat healthy. We need to look great, we need to be thin and we need this all fast. To achieve this goal many people have fallen into the “herbal craze,” taking natural supplements to help reduce appetite (and thus body fat). One ingredient in many over the counter dietary supplements is ephedrine. But how many people who start taking these supplements know they contain a central nervous system stimulant, let alone its effects? Ephedra sinica (also known as Ma Haung) is the plant that contains the active drug ephedrine. (Julien, 2003) It has been used by the Chinese to treat illnesses such as hypotension and narcolepsy for over 5000 years; and in the past century as a bronchodilator to treat asthma. (Backer et al 1997) Ephedrine is a psychostimulant that releases catecholamine neurotransmitters including epinephrine, norepinephrine and dopamine: it is a sympathomimetic agent that works on the adrenergic system. (Zahn et al 1999) Gruber and Pope in their article Ephedrine Abuse Among 36 Female Weightlifters wanted to know the adverse effects of long term ephedrine use. To target a group of people who would use dietary supplements for a long period of time the authors chose female weightlifters (perhaps female verses male because females are less likely to use anabolic steroids verses men because of the masculinizing effects of the drugs). To “recruit” a group to study, advertisements were put in local workout facilities offering $100 to participate in a research study. The aim of the study was not mentioned so as to not sway the group of applicants. Once set up to participate the authors needed to get a multi angled view of the individuals so an evaluation that was given covered many ranges including medical history, history of weight lifting/working out, the DSM-IV structured interview and urinalysis. But just an evaluation would not tell all that was needed to know so an interview followed. The questions that were in the interview included inquiries about substance abuse. Alcohol, cannabis, opioids, stimulants, anabolic steroids, ephedrine and other “performance enhancing” drugs were all inquired about. Ephedrine is not only dangerous for these effects but others as well. It causes great damage to the cardiovascular system. Some of these adverse effects are extremely high blood pressure (or hypertension), an increased rapid heart beat and cardiac arrest. (Haller and Benowitz 2000) There have even been deaths due to overdose of ephedrine. Ephedrine use (or abuse as some of the women have shown) is not a problem that stands independently. Gruber and Pope found that many of these women also suffered from other situations (both physical and mental). Eighty-nine percent of the 36 women had amenorrhea (the lack of menses). 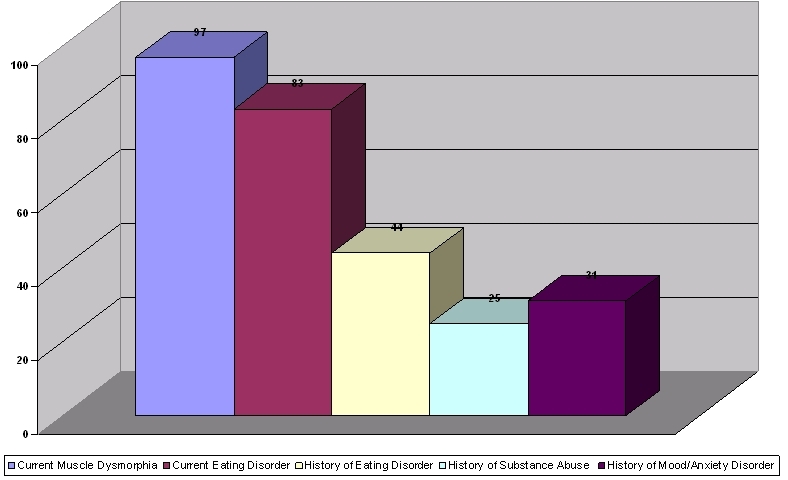 Figure 1 shows us that almost all (97%) of the women showed muscle dysmorphia which is “a syndrome characterized by obsessional preoccupations that one's body is not sufficiently lean and muscular.” (Pope, Gruber, Choi, 1997) Eighty-three percent currently have an eating disorder while 44% have a history of eating disorders; 25% have a history of substance abuse and 31% have a history of mood or anxiety disorders. The fact that ephedrine use is correlated with so many other disorders shows us that there is a bigger picture that needs to be targeted. We see that especially in the body building community the drive to look great and be thin is enormous. To do this many individuals use dietary supplements containing ephedrine, a dangerous and potentially extremely harmful stimulant. These individuals often do not realize that these dietary supplements containing ephedrine can produce effects including hypertension, palpitations and even cardiac arrest. This so called natural drug is not to be taken lightly; we all must become more aware of the consequences of taking such a drug. Just because ephedrine can be called ‘natural' does not mean it is safe.